Don’t get me wrong: I love Facebook, and I am one of its most shallow users. I’ll post anything – videos and pictures of cats (a lot), pictures of things I’m about to eat, reposts from The Poke. I love seeing other friends’ pictures of their day. The more trivial, the better, because it’s the trivia that colours and shades the detail of friendship. But knowing how much I loved it made it easy to decide to have a break from it (see earlier post). It wasn’t difficult to stop reading Facebook, in fact, it was rather like not having to scratch an itch anymore, but the impulse to post was an itch that wouldn’t go away. Within minutes, I realised that using social media had developed a tic in my brain I call “Facebook echo” – an internal voice that samples your experience in slices and presents it back to you as a status update before you’ve had a chance to take the experience in as a whole – like hearing the reverb before you hear the sound. Walking down a street, being with friends, eating in a restaurant, preparing a meal, reading the news, it didn’t matter where I was or what I was doing, I’d find events echoing back to me as potential Facebook or Twitter posts, whether I would actually have posted them or not. Remember Fred Elliott in Coronation Street, who said everything twice, I say, who said everything twice? A bit like that. Facebook echo digitises what was once an analogue experience – though the habit is so well-formed in my brain now, that I can hardly remember what it was like to live without running a rolling news service at the same time. Walking across the Charles Bridge in Prague (as I was when I started thinking about this) is no longer “a walk” but a series of photo opportunities that must be immediately captioned. The prospective status update makes you decide which bit of your experience to sample. Every glance, every thought and impression is processed, edited, captioned, categorized (humour, morals, social conscience, pet-hates, self-promotion, information, and so on). 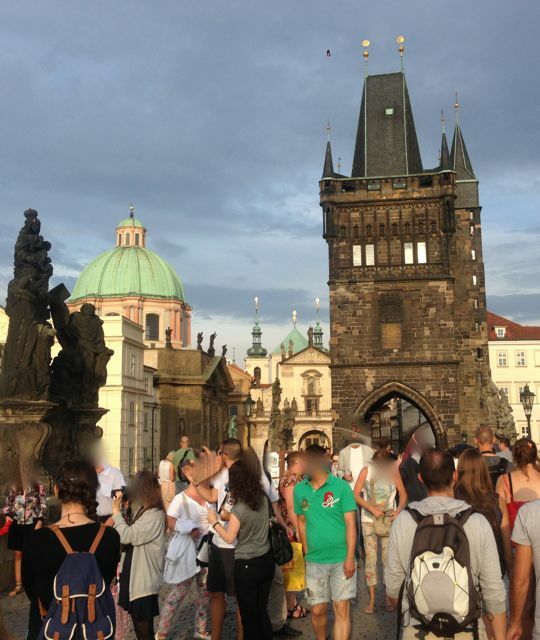 I’m not taking the moral high-ground here: for one thing, I was thinking all this only because I was crossing the Charles Bridge to meet someone that I hadn’t seen for some years, but who I’d stayed in touch with on Facebook. By that time I’d decided not to use Facebook for a week, but my journey across the bridge was slowed down by people starring in their own celebrity biopics of themselves in Prague. Even two weeks on, the urge to turn everything into a status update or a tweet is still there, but without the means of scratching the itch, it wears off, as the attraction of smoking did after I gave up. What I love is the return to privacy – to having a life that no longer has to be lived with your skin inside out. Andy Warhol’s predictions were not as accurate as people say, I think: we are not all famous for 15 minutes, we’re all starring in our own show 24 hours a day. If you’re not photographing yourself without make-up, someone else will be, as you become the unwitting backdrop for their selfie or holiday snap. Apparently 1 in 3 people would let their employer have access to their Facebook account in return for job security. If there was ever a reason to not have a Facebook account at all, this is it. For my taste, the wresting of privacy from an individual is wrong, whether it’s Facebook, your employer, or the Stasi/KGB who do it. When you’ve got a choice, to opt in seems crazy, but I think we are fast forgetting what privacy once meant, so there appears to be no choice to make. PS: I did think later on, if I care so much about privacy, why am I making this post public? I have no idea. This entry was posted in Personal and tagged IT, Personal, The World, facebook, privacy, social media on August 22, 2014 7:54 am by Jonathan Still.